We’re going to need you come in on a HOLIDAY. 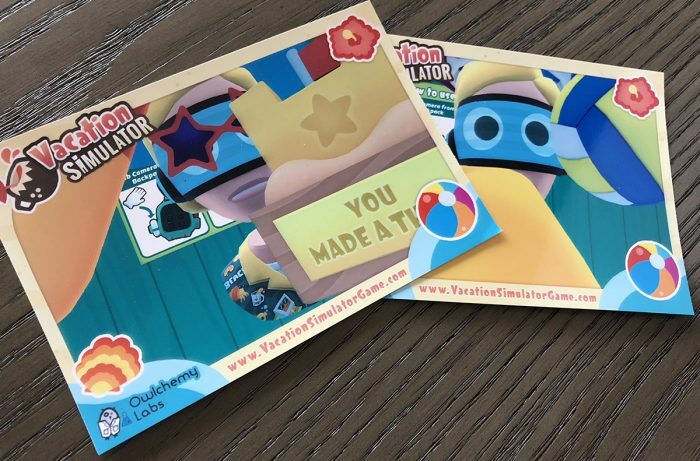 My daughter is a massive fan of Owlchemy Labs’ Job Simulator, so when I told her that I had the chance to play its sequel, Vacation Simulator, at PAX East this year, she was equally incredibly inquisitive and jealous. I no longer had to work, now I had the chance to play… as a robot. Vacation takes place in the same world as the original game, and with a similar premise: humans have disappeared from the planet, and now that robots have taken over their curiosity is piqued as to how the fleshy organisms lived. This time, though, they care about what people did in their free time. 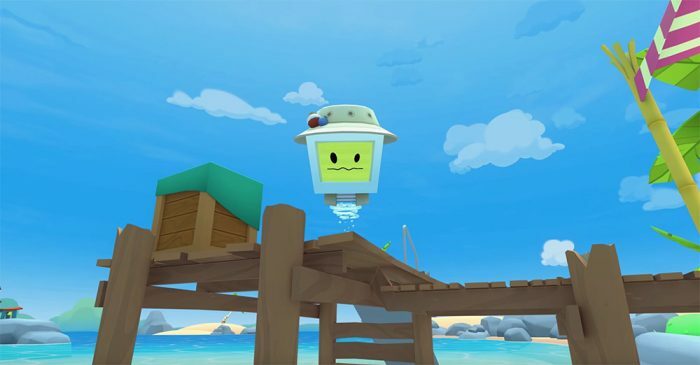 Showcased at Oculus’s Game Days offsite event at PAX East, the demo throws us right onto a beach, surrounded by floating TV screen bots who love to sunbathe. Job Simulator’s world was confined, but the beach is massive, and so Owlchemy Labs improved upon the predecessor by incorporating teleportation points around the environs. Just look at a specific glowing disk on the a surface, hit the teleport button, and zap; we’ve moved form the sandy shore to a tide pool. This lets us experience unique “mini jobs” at each zone. The beach itself has several of these points, with usually a few things to do in each area. On the beach proper, we’re handed a fris — err, flying disc — to throw around. Warning: don’t actually use the same force that you would in real life, as it can be easy to launch a controller several feet if you’re not gripping it well enough. I throw it at a sunbathing bot, who moans and belittles me for doing so. I pick it up and chuck it into the tide pool, zipping over to retrieve it. The pool lets us splash in the water, play with the aquatic life, or bash a beach ball around. I send the ball out into the ocean, and am chastised by the bot next to me. Nice. These mini areas are self-contained, but they ask us to take on tasks that keep us moving around the entire beach. It’s mentioned to me by one of the bots that a sand castle competition is coming up, and a trophy would be a nice thing to get. I whip over to a sand table off to the side of the resort and get to work. The sand castle is a sort of mini-game where we’re handed a blueprint and a variety of sand blocks, and asked to replicate the image we see. Some sections of this castle are three blocks high, while others are doorways or solid cubes. We need to grab the blocks and flip them around in our hands to make sure we have the right one, drop it in place and grab another. Once I’ve completed the castle, I get a nice, shiny trophy. Woohoo! “You might want to check out the dive shop,” I’m told, so I pop on over to that area next. I hop back outside, chat with more of the robots, pick up items and throw them around and into the water, enjoying the playful “ploop” I hear. The demo is timed, and so after my 10-15 minute trip into the Caribbean I’m back in the real world. Cool. I like this. It’s still cold here in Michigan, so I’ll take any kind of warm sun, even a fake one. And because the setting is sort of compressed, it feels like its filled with plenty to do, more so than Job Simulator. But the beach won’t be the only vacation. NAY. There *may* be a few other places to visit, I’m told. Anticipation for warm weather is strong. Vacation Simulator launches this year for Oculus Rift, Vive and PSVR.